Then you only need to re-program the epr7184 rom with 2 changed bytes. Great work on the Outrun code btw.. Interesting. Will look into that at some point this week and make the adjustment if it seems sound. I had assumed that the entire routine was contained within the 8751 and wasn't in the 68k code. The code was left over from when the game was developed and never removed when sega implemented the security. I remember now, as there is no interrupt vector pointing to the code. Changing $FF0 to A57C would fix the checksum test. The SHARRIR1 set needs $FF0 changing to A894. Also missing is the countdown the mcu does at the start. It halts the 68000 and displays the count down. Not sure exactly what it's doing but it doesn't seem important. The main different to the end user is that only 1 rom (ignoring the rom test) would need re-programming/buying. This patch has been tested on real hardware too. If this solution works, it is certainly more elegant so thanks for pointing me towards it. 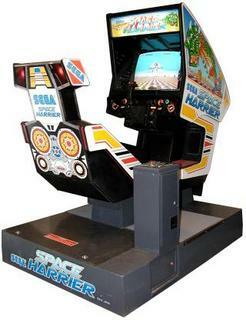 However, some questions: looking at the code in the Space Harrier routine you referenced, it is slightly different to the Enduro routine. For example, the Enduro routine has a bunch of NOP delays after writing to $140021 and $140031 (effectively selecting the ADC, then writing to it). Have you tried this on Enduro Racer hardware? Just naturally wary to go from something that is proven to work, to something new. The countdown is the MCU doing a checksum of the ROMs. There are two versions of the ROMset, and two different programs in the 8751, and they're not compatible. So using A version ROMs with non-A 8751 will hang after the countdown. Mark. I updated the release with your patch JunoMan. The fix for the game code is to eliminate this move of a trigger ram location to the game work flag. As always, many ways to skin a cat.. Does this solution still require "Enduro Racer hardware with the earlier YM2203 sound board"? can i use this patch on an bootleg enduro racer too ? there is no fd1089 on this pcb. Good question. I don't know unfortunately as I haven't investigated the bootleg hardware or ROMs. Chances are there will be some differences. does the readout from the prom help you ? i found an YM2151 on the original pcb, is this possible too ? if not, whats the differeence to the other Sound ic ? Maybe I can burn the mame rom to the Audio CPU ?